There is nothing lonelier than a cat who has been loved, at least for a while, and then abandoned on the side of the road. A calico cat, about to have kittens, hears the lonely howl of a chained-up hound deep in the backwaters of the bayou. She dares to find him in the forest, and the hound dares to befriend this cat, this feline, this creature he is supposed to hate. They are an unlikely pair, about to become an unlikely family. Ranger urges the cat to hide underneath the porch, to raise her kittens there because Gar-Face, the man living inside the house, will surely use them as alligator bait should he find them. But they are safe in the Underneath...as long as they stay in the Underneath. Kittens, however, are notoriously curious creatures. And one kitten's one moment of curiosity sets off a chain of events that is astonishing, remarkable, and enormous in its meaning. 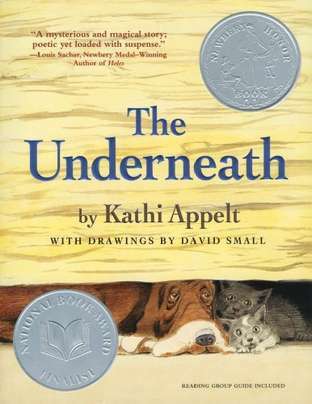 For everyone who loves Sounder, Shiloh, and The Yearling, for everyone who loves the haunting beauty of writers such as Marjorie Kinnan Rawlings, Flannery O'Connor, and Carson McCullers, Kathi Appelt spins a harrowing yet keenly sweet tale about the power of love -- and its opposite, hate -- the fragility of happiness and the importance of making good on your promises.